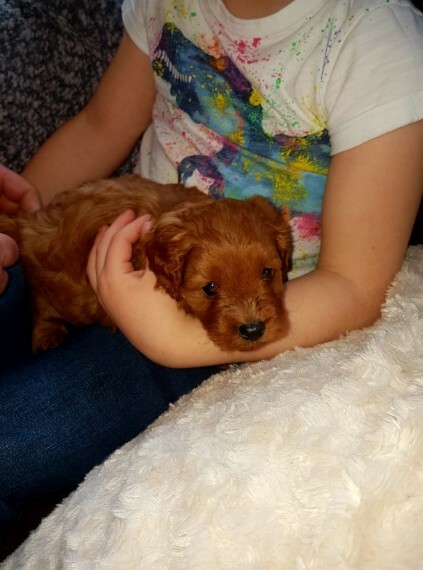 Our beautiful Kennel Club Registered Cavalier King Charles has blessed us with 6 F1 solid deep red Cavapoo babies; both boys and girls are available. Mom is our much loved family pet who is of course here to meet. She is a gorgoeus solid ruby girl with the sweetest nature. Her favourite spot is the sofa! This is her first litter. She is clear of: . Episodic Falling . Curly Coat Dry Eye Syndrome Proof is available to view. Their dad is a fox red dog,\"Jeffery\". He is a Kennel Club Registered Toy Poodle, standing just 11 inches to the shoulder. He has been health tested and is clear of: . Prcd PRA .Von Willebrands Disease Type . Familial Nephropathy . Degenerative Myelopathy. All certificates are available to view. Mom and babies have 24 hour care and are being raised in our family home and around young children. They will be very well socialised and used to everyday life. They are ready to leave from the 18th April at 8 weeks old. They will be vet checked, with proof, microchipped and insured with Petplan for 4 weeks. All will leave wormed to date, have a scent blanket of mom and some of their Royal Canin puppy food. A deposit of 300 (none refundable) will reserve the puppy of your choice. To discuss further please call.